In 1907, the west side of Government Street held a collection of late-19th-century commercial buildings. Government Street was still the heart of the business district, although there had been some movement to Douglas Street. The list of businesses illustrates the diversity of this portion of the street. 1244 Government – Royal Guarantee and Trust Co.
1242 Government – Northern Pacific Railway Co.
1212 Government – Great North West Telegraph Co.
1210 Government – B. C. Permanent Loan and Savings Co.
– Canadian North West Oil Co. Ltd.
1206 Government – National Finance Co. Ltd. This entire block of buildings was replaced by the new federal Post Office (Percy Leonard James, James and James Architect, 1948-1952). 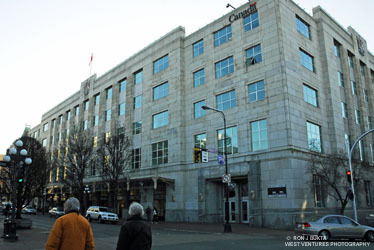 The Post Office was diversified in the late 20th century and the building redeveloped to include offices and retail on the main level. 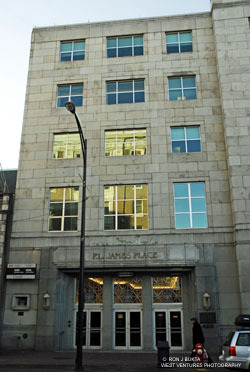 It was renamed P. L. James Place to honor the architect who was responsible for the design.